contains β-glucans that act to prevent cardiovascular disease and control diabetes. A specific and newly-patented variety of oat which improves mental health and supports cognitive performance. The properties of green oat have been known since the Middle Ages. Since that time, this variety of oat has been traditionally recommended for treating fatigue, lack of concentration and fluctuations in mood. Recent clinical trials conducted on this patented extract have provided scientific support for such recommendations and have specified effects in other areas. - support cognitive performance, particularly in stressful situations – a common feature of modern life. These two specific effects – on mental health and cognition – are the result of an inhibitory effect on two enzymes: monoamine oxidase B (MAO-B) and phosphodiesterase 4 (PDE4). • These two enzymes act on the central nervous system and are directly linked to mental health and cognitive function, playing a modulating role in anxiety, memory and depression. • It is likely that other mechanisms, beyond this enzyme-inhibition, are also involved in improving alertness. The inhibition of MAO-Bs is undoubtedly the most interesting aspect of this extract. • MAO-B inhibitors are actually proprietary drugs designed primarily for those suffering from Parkinson’s disease. They reduce the breakdown of dopamine and increase the concentration of neurotransmitters in synaptic junctions. • Natural Dopamine Support acts in a similar way to selegiline, a drug prescribed as an MAO-B inhibitor for treating Parkinson’s disease. • Professor Joseph Knoll, the Hungarian scientist who discovered this molecule, recommends taking low doses in a preventive capacity from the age of 50. Animal experiments have shown it has a beneficial effect on extending lifespan and improving functionality. 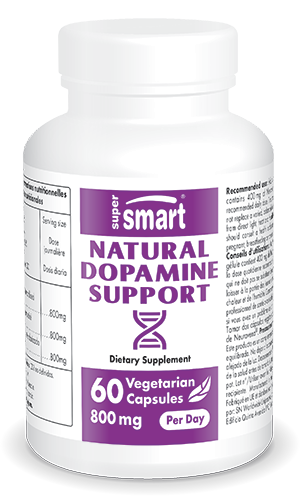 • Natural Dopamine Support thus has an overall anti-ageing effect on the brain. The effects of this proprietary oat extract have been attributed primarily to the presence of the flavonoid isovitexin. - a significant increase in concentration and attention, with greater ability to maintain focus during prolonged tasks. • The researchers also noted that taking Neuravena® resulted in fewer errors being made in memory tests. Neuravena® supplementation was also shown to improve vasodilation in systemic and cerebral arteries, which may also contribute to improvements in cognitive performance and prevent the amyloid plaque formation seen in Alzheimer’s disease. Finally, a pilot study reported beneficial effects on smoking reduction and cravings linked to poor stress management. • There is thus empirical data supporting the use of green oat. The quality of this oat extract is carefully monitored throughout the manufacturing process, from the sourcing of the raw material to the final product. • This variety of Avena is cultivated by contract farmers, with each batch carefully identified and evaluated. • In order to prevent degradation of the oat’s active substances, gentle extraction processes are used during manufacturing. You may also be interested in other natural formulations for long-lasting, effective protection against the effects of ageing, such as reishi extract and our transresveratrol anti-ageing formula. At recommended doses, Natural Dopamine Support has no side-effects. It is particularly suitable for easing cognitive disorders, including age-related problems, and for preventing ageing of the brain. Other ingredients: microcrystalline cellulose, magnesium stearate (E572) and silicon dioxide (E551). adults. Take 2 capsules a day. Each capsule contains 400 mg of Neuravena®.